If you have any concerns and simply would like a chat or discuss the options available then please feel free to call us for confidential information and advice about dyslexia. If we are unavailable please leave a message and we will return your call as soon as possible. Disclaimer: SDA Helpliners are all volunteers, operating from their own homes and fitting this service around other committments. They try their best to be helpful and offer up-to-date information. Please note that any action taken thereon is the responsibility of the caller. Before calling, scroll down the page to find out more about getting help. There are 3 categories: those in primary or secondary schools, further education (FE) or higher education (HE) and adults. First ask for an appointment with the class teacher (primary) or tutor/head of year (secondary). Tell them about your concerns and why you think your child might have dyslexia. If possible, have ready a list of your worries to give to them. Or you can download a dyslexia check-list from the British Dyslexia Association website: www.bdadyslexia.org.uk/parent/indication-of-dyslexia If anyone else in the family could have dyslexia, tell them. After a meeting with the class teacher or head of year, if you still have concerns, you should make an appointment to see the school SENCo. Be ready with a list of your worries so that you miss nothing out. If you think dyslexia is in the family, tell them. Teaching staff are trained to assess pupils (using a variety of methods such as observations, informal assessment and tracking progress) who show unexpected learning difficulties, to find out their specific strengths and weaknesses, rather than whether they have dyslexia. Teachers use a range of inclusive dyslexia friendly strategies in their classrooms which meet the needs of all pupils including those with dyslexia. If pupils are not making the expected progress, then teachers or the Special Educational Needs Coordinator (SENCo) can then arrange small group, or individual, targeted, teaching, using dyslexia-friendly methods, based on ongoing assessment by observation and informal assessment. Sometimes a pupil still doesn’t make the expected progress and the school may want further advice. Then schools, if they need to, can ask for help from the Learning Support Services. Following discussion, this may lead to further assessment with the aim, always, of getting the information needed to provide the right kind of targeted support. Somerset is officially a Dyslexia-Friendly county. 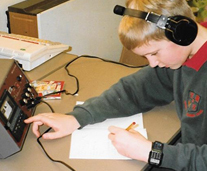 Schools have the opportunity to become an ‘Inclusive Dyslexia-Friendly’ school. The whole school is involved in the training. Training is provided by the Learning Support Service. It can take up to 2 years. The poetry of a 9 ½ yr old. 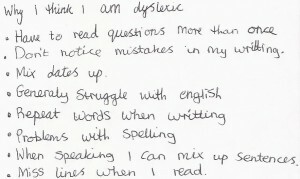 Sometimes people just need to know whether they or their child has dyslexia. 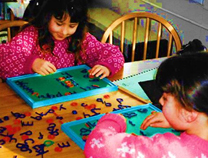 A full assessment for dyslexia must be done by fully qualified assessors. Please go to the ‘Tutors and Assessors’ page on this website for contact details. It is always a good idea to talk about this with the school first. Often schools welcome the report with its recommendations. If you would just like to have a chat about dyslexia ring the SDA helpline. Or come to the Drop In. Go to see the disability advisor at your college or university who will discuss your difficulties with you. This may lead to a full assessment and support for your difficulties via the Disabled Students’ Allowance. If you feel you might have dyslexia and are in employment, ask to see your line manager or HR department at work, especially if you feel your difficulties are affecting your performance at work; some are very helpful and understanding. Or if you would just like to have a chat about dyslexia ring the SDA helpline. Or come to the Drop In. We may be able to help in other ways such as finding assessors and private tutors.